Yep, Steve certainly has the bases covered. If taxes are driving you to drink, then head on over to his Wilmington, Del., liquor store to quench your literal and tax thirsts. Once you fulfill your annual IRS filing duties, reward yourself by picking up a six pack or, depending on just what the final tax bill damage was, something a little stronger. 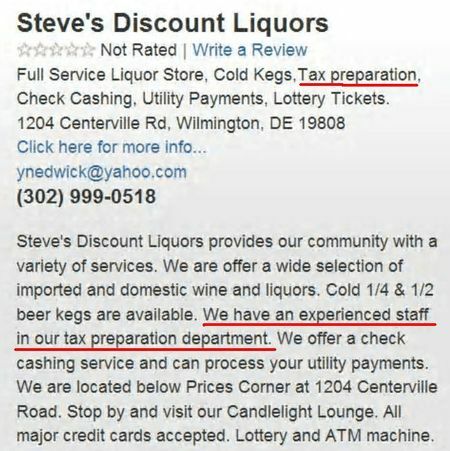 Mary O’Keeffe, on whose blog Bed Buffaloes in Your Tax Code I ran across this cross-discipline marketing gem, tells us that Steve’s package store apparently is real, as is the on-premises tax preparation option. The IRS authorized e-file provider search engine shows a tax service at the same address as the beverage business. Obviously Steve and the tax preparer know their customers. Is anyone else thinking franchise opportunity here?